Last year Sisters Kiwanis awarded a career opportunity grant to Lori-Jean Pruitt. She used the funds to attend a tattoo school in Salem where she learned the art of cosmetic tattooing. 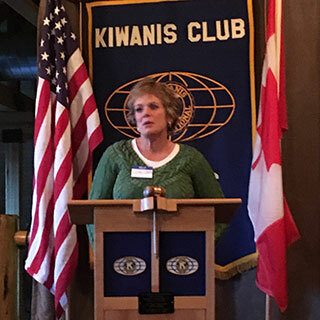 Recently, Lori-Jean presented to a Kiwanis meeting on her schooling and career plans. She mastered a number of cosmetic tattooing techniques that help patients. Her studies included skin camouflage to improve the appearance of persons with skin diseases; also scar camouflage to enhance the appearance of patients injured in accidents, from burns or surgeries. Tattoos can also help congenital disorders such as cleft palate or beauty marks. In addition, she studied microblading, the use of a specialized tool to create fine hair strokes for eyebrow enhancement. Lori-Jean is launching her professional career at KaNui studios in Redmond. She plans to set her prices at levels accessible to the average person, noting that cosmetic tattooing tends to be quite expensive and out of reach for many people. Her life goal is to help people feel better; one's self confidence increases when their body image is improved. Cosmetic tattooing can make a drastic difference in body image. Sisters Kiwanis awards career grants to Sisters-area adults who are seeking a career change. This program, known as the Kiwanis Career Opportunity Fund (COF) assists adults (25 or older) who are financially unable to return to school or retrain for a career change. In recent years, Kiwanis has awarded grants to more than 30 local residents. Recipients of recent grants attended dental hygiene school, did floral design training and completed vocational welding classes. The Kiwanis Career Opportunity Fund provides assistance to start, augment or complete a career that may include vocational, technical, artistic or general fields of study. Funds are available to qualified residents within the Sisters area regardless of age, gender, disability, marital status, race or current occupation. Kiwanis does not set limitations on potential use of the award. COF applications are available on the Kiwanis website: sisterskiwanis.org/about-us/career-opportunity-fund, at the Sisters Habitat for Humanity office, from Family Access Network, or by calling 541-410-2870.